This delicious recipe contains Cafédirect’s Machu Picchu ground coffee which has hints of chocolatey undertones and combines it with Fairtrade sugar, chocolate and vanilla to make a delightful batch of Mocha Crumb Muffins. A tasty way to celebrate Fairtrade Fortnight! 1. Preheat the oven to 180°C or Gas Mark 4. 2. Make the crumb topping. In a large bowl, combine the sugars with the cocoa powder, ground coffee, flour and salt. Add in the melted butter and stir until just combined. Don’t overmix. The mixture should come together in large clumps. Set aside. 3. 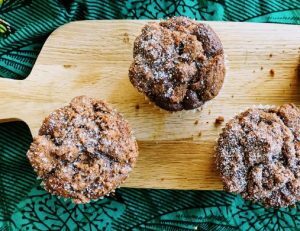 To make the muffins, in a separate bowl, mix the flour, brown sugar, cocoa powder, baking powder, salt and ground coffee. 4. Break up your Divine Cappuccino Chocolate bars and add them to this mixture. 5. Add the yoghurt, oil, eggs and vanilla extract and mix until just combined. 6. Spoon out the muffin batter into 12 muffin cases about halfway to the top. 7. Press the set-aside crumb topping into the top of the muffin batter to ensure it stays put when it is baked. Combined, the batter and the topping should reach ¾ of the way to the top of the muffin case. 8. Bake for 17-20 minutes or until a skewer comes out clean. Allow to cool before removing from the tin. 9. Dust with icing sugar before serving. 10. Muffins should keep in an airtight container for up to 5 days at room temperature. Recipe created by Erik Houlihan-Jong.